You know the saying "two wrongs don't make a right"? Well, this is a tale of two bad products making a roundabout right...sort of, but that is taking the most optimistic approach possible. The first bad product was the wood composite siding, basically a fancy textured form of particle board. We bought a house just three years old and every house in our neighbor had this same siding, which looked quite good at time. The problem with the product is that water droplets hang on the bottom of the panels and eventually get absorbed up into the porous attributes of wood pieces glued and pressed together as a sponge does water, which causes expansion of the bottom edges and the more expansion, the more spongy it becomes and the further up the panel the damage goes. Apparently, even if we had painted every every few years to better protect the siding this still would have happened to some degree. 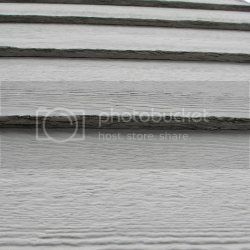 When we saw this was beginning to happen to our siding, we just were not even considering residing the house and we had been hearing of another product with the claim of never having to paint again. I was not so convinced as I have this natural caution of anything new. For instance, as much as I love technology, I am not the first to jump on the latest Windows version, as I like to give it a good year for everyone else to do the beta testing and them fix all the bugs before I commit to it. My husband, on the other hand, is more of a risk taker. Next thing I knew we were signing a contract. That was in 2004. Sometimes taking a risk works out well and sometimes it just does not. This may not have been the worse mistake we ever made but, as I see it, this one was tied with two others for first place...and we are not going into those today. 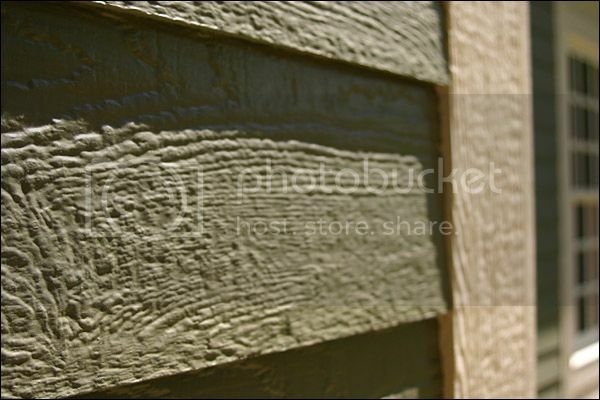 The product itself was a very thick latex "coating", equivalent to something like 20 layers of paint, that would cover every bit of wood composite siding so that there would be no porous areas for rain to get in therefore it would stop further deterioration. That was the promise. The reality was...well, quite a bit different that we anticipated. From the time the crew first arrived, this whole project just went wrong in every which way possible. They caulked everything, and I do mean everything, even where siding panels overlap each other and bottom of ever panel to fill in the porous areas so that water would not be soaked up ever again. The repairs to replace the rotten wood was done horribly wrong. The coating color was wrong, way too bright of a yellow. I wish we had fired them when we saw the quality of the work, but we were assured it would be rectified. I rarely regret anything from my past, because I know that I would have done the same thing in the same circumstances but this one is the exception. I wish we had looked into replacing the siding back then; the sad part is it would have cost about the same. I really wish we had never signed that contact, but once that was done I wish even more I wish I had not handed them that final check. We were not the only ones taken by this product and I learned a lot about the engineering of why this was the worst possible thing we could have had done to our house, perhaps to any house. You see, housing engineers will say that the problem is not so much about moisture getting in, but that moisture has to be able to get out. A house has to breathe and the way they had done all the caulking and then applying that coating was the surest way to trap in moisture so it could not get out or dry out. We had a moisture analysis done and the greatest moisture was in the corner structures and in the frames of our wood windows. Having the coating removed was not only labor intensive, requiring heat guns for it to blister up, but would have been more damaging on the already deteriorated siding taking some of the composite pieces of wood with it. Besides, removing the product was only part of the problem: removing the caulking filling in the siding edges was impossible. Our only solution, since the coating company went out of business within a year--lifetime warranties only work for the lifetime of the company--was to reside entire house and replace the windows, frame and all, and we did not have the money to do that. We planned to begin for residing the house as soon as we paid off the costs for the coating, but in May 2007 my husband was injured by a horse and was on medical leave for about four months and was making about 60% of his usual take-home pay. He was back on the job full-time for a couple of months and then the first of December 2007, he lost his job for the first time in his life and the company car also. We lived on severance pay for weeks and the Lord gave him the job He had promised, but it was at about the same take home pay as his severance pay had been. We eked by, but there was no saving toward the siding for two years. However, we also had a four-year drought, which was becoming alarming as to water availability, but it was saving our house because moisture levels dropped. Yes, there are blessings for some people even in things like droughts. In 2012, the Lord gave my husband a new job, out of the blue, that paid more like he used to be, but no company car and we would need one since he would not be flying as much as the last job. So, we went into debt for an old used van, which we had repaired and paid off within a year. We still lived very frugally, but also had a few things fixed that we did not have the money to repair previously. Finally, in 2013, we were able to start getting some traction on saving to get the house fixed. We had a few estimates to know what our target amount would need to be and last fall, 2014, we figured we would have about half of the cost saved up by this spring and the Lord again provided a company owned and operated by Christians that was a few thousand lower than our other estimates. In May of this year (2015), the major work we needed done on our house began. Ten years later I can say that one thing was true, we did not have to paint nor will we ever have to paint those siding panels again, but we are now in debt for half of the costs. My Lord, the journey has been so long just to get to this place. Thank you for making it possible. Things could have gone much worse than they did without Your presence. I'm glad to hear it is progressing! Pam! You have been on my mind SO much the last few months! What be you doing, girl? Weird. I have been messing with this site in the background now and then but your replies should not be disappearing. I'll try and call this afternoon.